In 1932, in the midst of the Great Depression, Chanel launched her first collection of haute jewelry. It consisted of diamonds set in platinum and was shown in an exhibit entitled “Bijoux de Diamants.” In 2012, on the 80th Anniversary of that exhibit, Chanel debuted a new fine jewelry collection and, in homage, called it, quite simply, The 1932 Collection. In February 2013, the perfume that went along with that jewelry launch will be released. 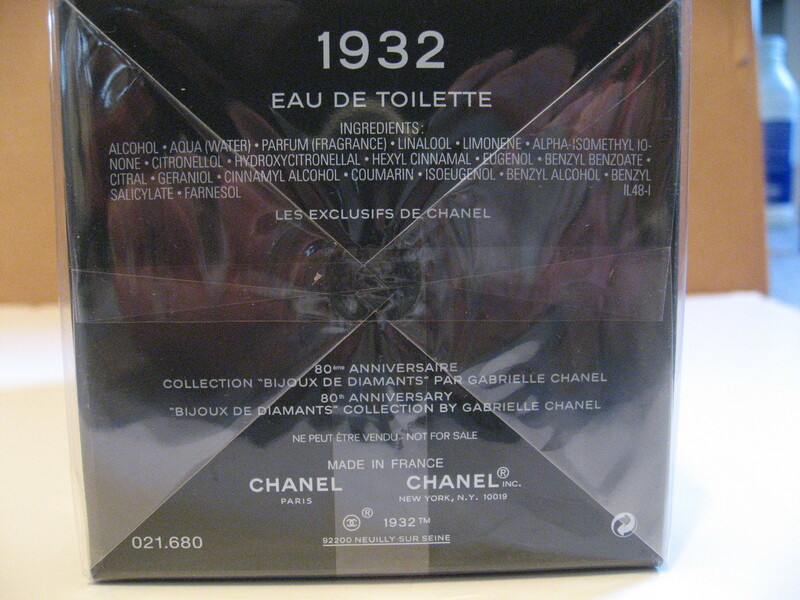 It too is called, quite simply, 1932 and it is part of Chanel’s Les Exclusif line of fragrances. I have a sample of it already and will do a review sometime in the next 10 days but, in the meantime, I thought I would share some lovely photos I came across from Elle magazine as well as information first posted exclusively by the blog, The Scented Salamander. To celebrate the 80th anniversary of the exhibit, Chanel has created a new collection of diamonds, pink sapphires, pearls and more, called the 1932 Collection. Though the gorgeous high-end baubles aren’t on display to the public—Chanel built a giant dome outside the Museum of Modern Art in New York to house the display starting next week (and for one week only)— you can view part of the collection right here. ELLE.com has a sneak peek at the goods and a look back at Coco Chanel’s (pictured) original exhibit from 1932. 1. Star-themed jewelry on display at “Bijoux de Diamants” in 1932. Coco Chanel was often inspired by celestial motifs. 2. Diamonds necklaces on mannequins. First up, the “Noeud Papillon necklace, displayed on a mannequin. Using wax busts instead of jewelry trays was considered revolutionary in 1932. You can see the remaining photos of past and present fine jewelry at the Elle website. Onto the perfume! On February 1, 2013, Chanel will launch a new perfume as part of its Les Exclusifs perfume line. This one will be called, quite simply, 1932. I don’t know if the perfume will launch in U.S. Chanel boutiques at that time, but I do know that the perfume is already being sold over the internet with photos being posted on random sites. I’ve also read that Chanel handed out sample bottles of “1932” to guests at a special VIP showing of the special 1932 jewelry collection. I obtained my 10 ml decant from my eBay secret weapon, Deborah, who got it as part of a split with a friend in Michigan. I haven’t tried my decant yet, as I prefer not to test out perfumes until I’m ready to focus on them in-depth for a full review. I also wanted to get some background on it beforehand from Chanel. So I contacted Chanel twice to ask them about the notes in the perfume. The responses indicated that either the Chanel representative had absolutely NO idea what I was talking about and had never heard of 1932, or that she couldn’t talk about it prior to its official launch. Despite my very clear question, I was simply given a run-down of the perfume notes in all the existing perfumes in the Les Exclusifs line. There was no reply to my more pointed follow-up question and email about 1932 in specific. (I’m a lawyer. I know how to ask follow-up questions that are pretty damn clear.) Silence and no response. In 2012, Chanel issued the high jewelry collection entitled the 1932 Collection featuring 80 pieces reprising this galactic inspiration to fête the 80th anniversary of the diamonds exhibition. The Eau de Toilette follows this year; inspired by this homage to a forgotten chapter of the Chanel legacy it is described as a delicate powdery floral. 1932 centers on the ingredient jasmine, for which the house of Chanel is reputed to hold particularly exclusive harvesting rights in Grasse. The floral accord is said to have been worked upon, petal after petal, chiseled thanks to that other luxurious floral, iris. Vetiver and musks anchor the perfume. Price: 130€ for 75 ml. Jasmine, vetiver, musk, coumarin, cloves (ie, eugenol), cinnamon (? ), citrus (lemon and lime?) and some other technical things. When it was launched in 1977, the original Opium was full of eugenol and also contained linalool, and limonene found in citruses. In large doses, Eugenol can cause liver damage, while oxidized linalool can cause exzema and prolonged exposure to pure limonene can irritate the skin. Obviously, no perfume in 2013 will have any of those ingredients in anything remotely close to dangerous quantities. Not a chance in hell. Still, it’s interesting that Chanel’s 1932 will contain at least 3 of Opium’s more iffy notes: eugenol, linalool and limonene. Frankly, and speaking only for myself, I couldn’t care less if it means that 1932 will smell something like Opium! In perfumery, farnesol is used to anchor and enhance the components of a perfume. Because it is a key ingredient in perfumes (and therefore a possible allergen), it is one of the 26 specific fragrance ingredients that have to be declared according to the EU cosmetic directive. […] [Y]ou’ll find it in as a component of citronella, lemongrass, tuberose, rose (and more). It’s a versatile, controversial and complex ingredient. Jasmine, rose, some possible rose enhancers (farnesol), bergamot (or lavender or coriander), cinnamon, cloves, violet or orris/iris, coumarin (hay), musk and possibly vetiver. Again, I’m not going through the ingredients because I am personally concerned about allergens. I’m not. For myself, not even remotely. Plus, to me, learning the chemistry terms and the technical details of perfume is a bit like finding out how a sausage or hot-dog is made; I prefer just to eat it. In short, I’m merely trying to get a bloody clue of what’s in the damn perfume since Chanel refused or failed to answer my questions. That said, I have to admit, I find it incredibly sad how many wonderful and key ingredients are the source of IFRA restrictions. Yes, they haven’t banned the use of the ingredients flat-out, but the quantities are so reduced nowadays that one has to wonder what “1932” would have been like if it had been made in…. well, 1932. Anyway, I hope you enjoyed the sneak peek at Chanel’s magnificent diamond jewelry and at “1932,” along with my attempts at playing amateur perfume detective. If you’re interested, I can get the perfume review up sooner rather than later and without waiting for some sort of official press release on the subject. Have a good week!